At Core-Mark, we value the hard work and dedication of our warehouse workers. They ensure products are delivered safely and in a timely fashion, maintain a clean and safe workplace, and provide a supportive work environment. 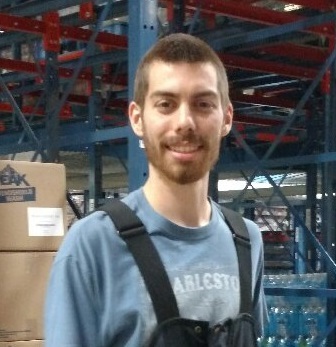 Hear from Ryan Sorce, a warehouse employee who has been with Core-Mark for nearly four years, on why he enjoys his job at Core-Mark. I believe it is very important to work for a company that takes care of employees. Core-Mark offers employees great pay and an excellent schedule. Core-Mark has offered me the opportunity to learn general workplace skills such as time management. I have also increased my mechanical skill set since joining the Core-Mark team. My favorite part about working at Core-Mark is that they provide employees with wonderful benefits. I am offered a great health plan and an excellent work schedule, which allows me to spend more time with my family. Core-Mark offers a nice work-life balance. Every Saturday is guaranteed off, which means employees will have weekend time to spend with their families. I believe that an employee should always be reliable. At Core-Mark, reliability is the cornerstone of our company success. With endless growth opportunities and guaranteed work-life balance, Core-Mark is a great place to grow your career. Are you ready to join our team? Explore our warehouse opportunities today!